In our latest book we devote an entire chapter to a post-World War Two program known as Project Paperclip, a nefarious undertaking which involved secreting Nazi scientists – some of them known war criminals – into America to provide much needed scientific expertise. Our research showed direct, proven links between some of the war criminals and Nazi concentration camps – Auschwitz and Dachau included. Interestingly, our research revealed another post-WW2 program remarkably similar to Project Paperclip, this one involving Japanese scientists and war criminals rather than the Nazis. The US was a key player in this program, too. The Japanese program involved a ghastly human experimentation project at the infamous Unit 731, an isolated Japanese Biological Warfare research facility located in what was then Manchuria, a Japanese puppet state, but is now Northeast China. It’s worth studying to better understand why Western superpowers protected known war criminals – Nazi and Japanese – throughout the mid-late 20th Century. Unit 731 Japanese Biological Warfare research facility. The experimentation project was the brainchild of the notoriously cruel General Shirō Ishii, a scientist who was effectively Japan’s equivalent of Dr. Joseph Mengele. 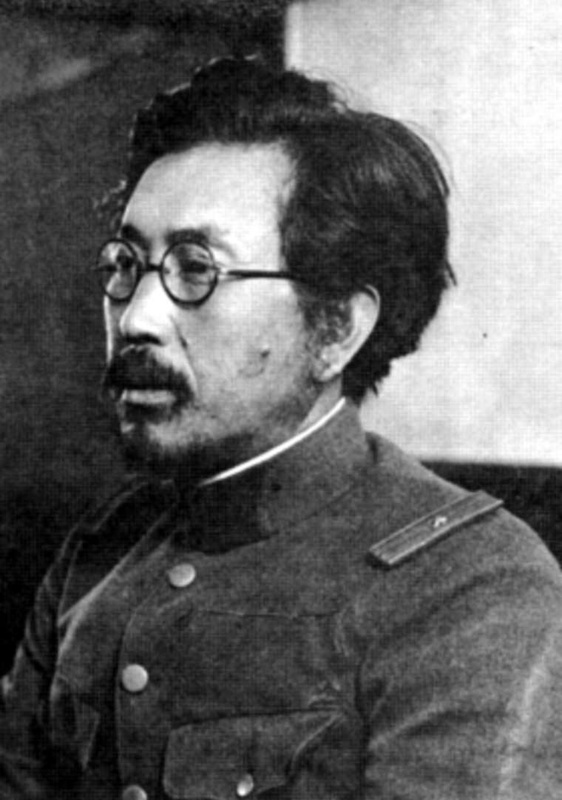 General Shirō Ishii…Commander of Unit 731. Researchers at Unit 731, which facilitated secret biological and chemical warfare research, mainly used captured Chinese and Russian subjects for their horrific medical experiments. However, their human guinea pigs also included American, Australian, New Zealand and British prisoners of war. General Ishii’s medical testing at the secret Manchurian facility included high-voltage electric shock experiments, cyanide poisonings, frostbite studies, biological weapons testing including anthrax, heroin and other drug tests, and injecting prisoners with bacteria from plague-infected fleas procured from mice; live dissections on prisoners were also common and the victims were not even given any painkillers while their bodies were slowly dissected. The prisoners were referred to as “monkeys” in scientific papers, even though it was common knowledge amongst the Japanese military and in political circles that the test subjects were in fact humans. Tens of thousands of victims died at Unit 731 and its sister sites. Although less widely reported than Mengele’s medical research at Auschwitz, many historians have compared the hideous medical experiments at Unit 731 to the Nazi medical experiments during the Holocaust. 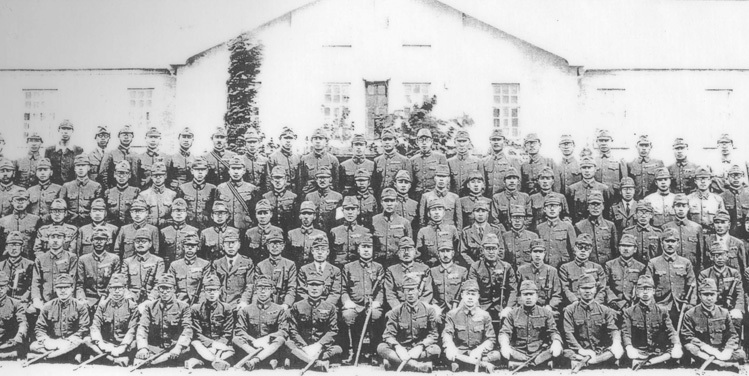 Japanese soldiers stationed at Unit 731. Parallels with Project Paperclip are numerous. Declassified documents have revealed that after the war ended, large-scale collaboration occurred between America and scientists of Unit 731. What’s more, the insidious Japanese research became the basis for many US military operations – and like the Nazi scientists protected by Project Paperclip, many of Unit 731’s scientists went on to have prominent careers after the war. Just as the Nazis had made incredible scientific breakthroughs during the war years, it appears Japan was another scientific giant of the era. Germany and Japan obviously got the jump on the rest of the world in the area of medical research by being able to ruthlessly experiment on as many human subjects as they wanted. And this informative and valuable research was desired by both the US and the Soviet Union at the start of the Cold War. Japan’s scientific breakthroughs most likely explain why General Ishii and all the other Japanese scientists involved in Unit 731 were never tried for war crimes by the US or by any other Allied nation. General Douglas MacArthur…orchestrated a deal. The following year, in exchange for all their biological warfare research, MacArthur orchestrated a deal with the scientists of Unit 731, including General Ishii, whereby they were secretly granted complete immunity from prosecution. Claims of the horrors Allied POW’s endured at the hands of their Japanese captors were from that point on ignored, and the ensuing Tokyo War Crimes trials omitted reference to Ishii and his staff. 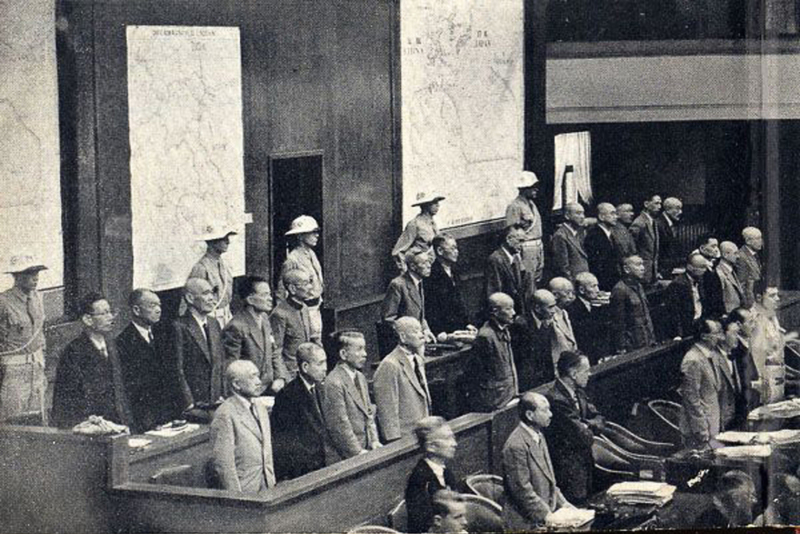 Japanese war crimes trial defendants…those involved with Unit 731 conspicuous by their absence. In the decades immediately after the war ended, the Japanese and American governments continuously denied any conspiracy surrounding the legacy of Unit 731. However, another file from General MacArthur’s headquarters confirms the ugly truth. In it, MacArthur states that in studying General Ishii’s work, “utmost secrecy is essential in order to protect the interests of the United States and to guard against embarrassment”. Like the US, the Soviets also appear to have secured some of the Japanese scientists’ human experimentation research, for after WW2 a biological weapons facility was built in Sverdlovsk, in the Soviet Union. The Sverdlovsk facility and practices within it are said to have been almost a carbon copy of what was detailed in Unit 731 documents. Many conspiracy theorists as well as a number of biological weapons researchers claim the US military secretly began testing germ warfare on American citizens without their knowledge. These tests, which were apparently conducted from the 1950’s onwards, are said by some to be based on the science of Unit 731, and include tests still classified by the CIA and the US Army’s Chemical and Biological Warfare laboratories. The suspicion lingers that many of the US military’s covert biological warfare operations since WW2, including the Vietnam War’s Operation Ranch Hand, may be related to Unit 731 – and Gulf War Syndrome could also be the result of biological warfare directly inspired by General Ishii’s germ warfare experiments. If by chance Chemtrails – that favorite Tinfoil Hat theory which suggests governments release chemical agents into the skies above populated areas – is one day proven to be a reality, then the Japanese experiments could also be the basis for these as well. 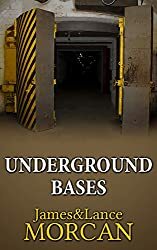 Along with Yamashita’s Gold and Project Paperclip, Unit 731 and its aftermath – including America’s involvement – remained one of the best kept secrets of the post war era. The public finally learned about this dreadful secret in 1993 when then US Defense Secretary William Perry finally declassified army and intelligence records relating to the Japanese human experimentation during WW2. Defense Secretary Perry finally spilled the beans about Unit 731. History reminds us that communism was already a dominant political force even before the echoes of World War Two had faded. After the war, as the Soviet Union began to encroach on more and more nations, communism and the threat of nuclear war were the West’s two big fears. However, there is a lesser known school of thought that says fascism actually posed an even bigger threat post-WW2. On the surface, this theory doesn’t make much sense for officially speaking fascism was all but expunged from the Earth when the Allies demolished the Nazi war machine. From then on, the only fascist remnants appeared to be obscure far-right political parties as well as the odd white supremacist or anti-Semitic group. But that’s just on the surface and what the history books tell us. 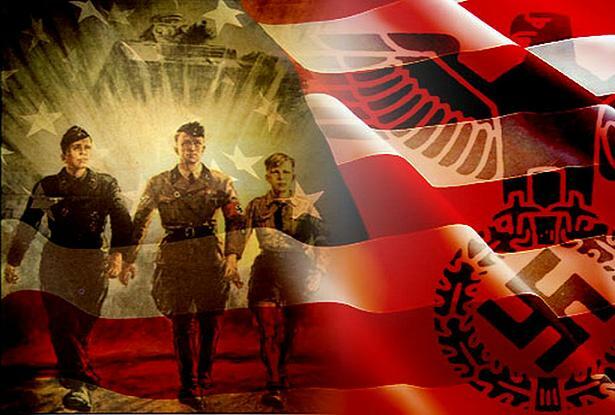 Alternative versions that lie beneath commonly accepted 20th Century history claim many Western nations – the US in particular – only missed out on becoming fascist states by a whisker. Such ideas pose the almost unthinkable question: what if Nazism morphed into something else and continued underground, in another guise, in the West? Fascist ideologies, practices and technologies didn’t vanish with the death of Hitler and Nazi Germany, this radical conspiracy theory suggests. Instead, they actually grew in popularity with fascist supporters springing up in senior positions of power in various Western governments. However, this theory asserts that fascism became harder to detect because of its more subtle implementation, which perhaps indicates this new breed of fascists learnt from the failures of the Third Reich. We thought so too…until we came across a little known US Government program whose declassified files reveal damning evidence of co-operation between Nazi party survivors and the highest ranking American politicians. As stated in chapter 2, America’s mind control programs stemmed from the US Government’s Project Paperclip, but it wasn’t just Nazi brainwashing techniques the Americans inherited. They also seized Nazi scientists whose number included known war criminals. The top secret project, also known as Operation Paperclip, was a nefarious undertaking that allowed Nazi scientists to migrate to the US without prosecution. Some had studied brainwashing and other mind control methods first-hand in the concentration camps; many were rocket scientists who had been directly involved in the development of Germany’s feared V-1 and V-2 rockets. The latter’s contribution would pave the way for NASA and the Moon landings, and also for America’s Intercontinental Ballistic Missile program. 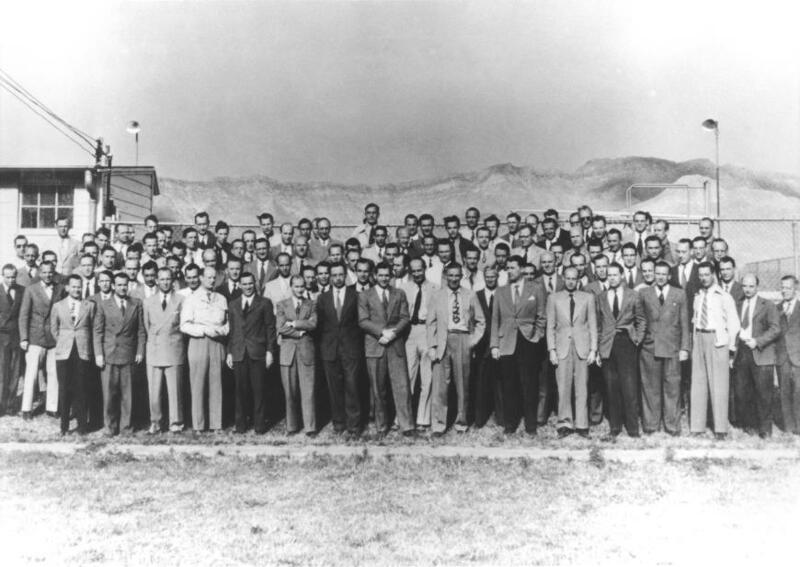 Nazi rocket scientists who made up the Project Paperclip team at Fort Bliss, Texas. Project Paperclip was as much about denying German scientific expertise to the Soviet Union and Britain as it was benefiting US science, defence and space programs. This was happening as the Cold War loomed don’t forget and an uncertain world was being carved up by superpowers. It was a three-way grab (for the spoils) between the Americans, the Soviets and the Brits. Remember, Nazi Germany’s scientific breakthroughs were nothing short of revolutionary. Although it didn’t last long, the Nazi era was arguably the most accelerated scientific period in history, especially when suppressed or little known Nazi inventions are taken into account. History reminds us how easily the Third Reich dominated Europe despite being greatly outnumbered by the combined Allied forces. The Germans ruled the land, sea and air, and it was obvious to all they had superior technologies. The Germans’ V2 rocket (above) and the horror it brought to the Brits in WW2 (below). The Allies learned the hard way that Nazi engineers and scientists had made incredible breakthroughs in various fields. These included semi-conductors, plasma physics, ballistic missiles, laser technologies, electromagnetic weapons, computers, astrophysics, infrared night vision and miniature electronics to name but a few. While some of these breakthroughs were commonly known, others remained classified and were kept secret for decades. A BBC News report dated November 21, 2005 nicely summarizes the situation that existed at the close of WW2. That report states: “The end of World War II saw an intense scramble for Nazi Germany’s many technological secrets. The Allies vied to plunder as much equipment and expertise as possible from the rubble of the Thousand Year Reich for themselves, while preventing others from doing the same”. The report continues: “The range of Germany’s technical achievement astounded Allied scientific intelligence experts accompanying the invading forces in 1945”. That BBC News report also reminds us “It was the US and the Soviet Union which, in the first days of the Cold War, found themselves in a race against time to uncover Hitler’s scientific secrets”. 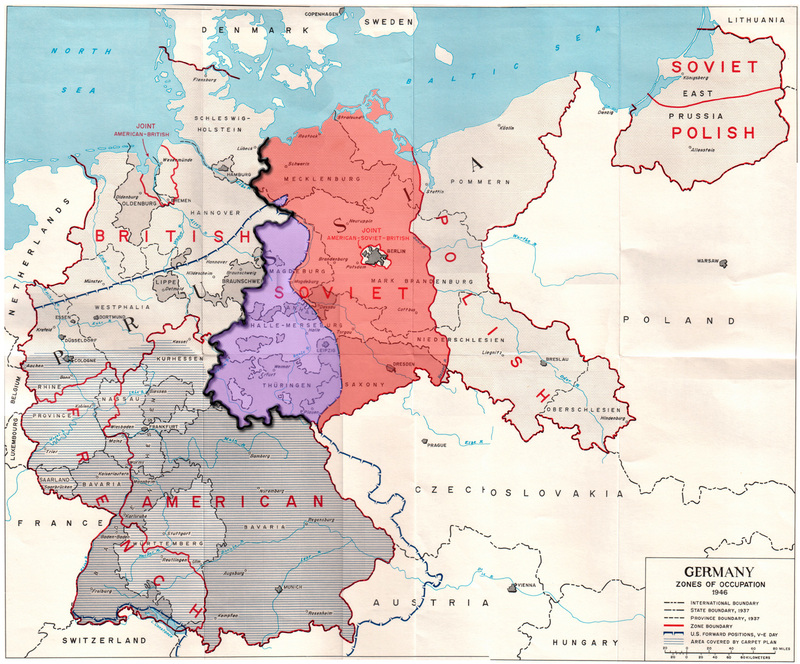 Allied occupation zones in post WW2 Germany with the US, Russia and UK competing for the spoils. Project Paperclip was America’s solution to this problem. 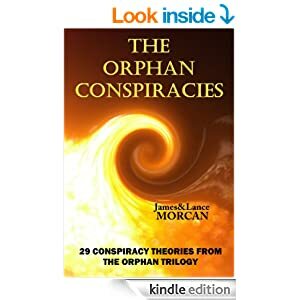 Supposedly named after the paperclips that were used to attach the files of the recruited German scientists, the project was the brainchild of America’s Joint Intelligence Objectives Agency (JOIA), a sub-committee of the Joint Chief’s of Staff of the US Armed Forces. Project Paperclip’s architects viewed their secret endeavor as the solution to harnessing Nazi scientists’ superior knowledge and expertise, and positioning America as the world leader in science and technology. The recruitment of Nazi scientists began as soon as the war ended although the project itself wasn’t officially signed off by President Harry Truman until three months later. It should be noted that while Truman stipulated that scientists who were active in the Nazi Party, or who actively supported it, should not be recruited, such limitations would have precluded the recruitment of the most eligible prospects. Declassified files show that Truman’s orders were ignored.All recruits were cleared to work in America after their backgrounds were cleaned up. US authorities created fake resumes, removing any mention of Nazi involvement, and entire false identities were designed for the highest profile war criminals. Those same declassified files also indicate that, at one point, around 10,000 Nazis were living undercover in America. (Some estimates are as high as 15,000). Many were awarded citizenship. Imagine how many descendants of those Nazis reside in the US today. It’s quite possible some are reading this book right now. Tom Bower’s 1987 book, The Paperclip Conspiracy: The Hunt for the Nazi Scientists, provides an insightful look at the history behind the project and reminds readers how quickly morals can be set to one side to meet an apparent need – in this case the need for scientific knowledge. The author cites official WW2 files as his main source of information. Reviewers of Bower’s book have picked up on a key point he makes – notably that the Americans, Soviets and Brits were fiercely competing to secure Nazi scientists for themselves and were prepared to overlook the fact some, or possibly many, were known war criminals. Various international media reports have also confirmed Britain and other countries outside the US were extremely active in pursuing Nazi scientists. For example, The Guardian newspaper edition of August 17, 1999 reports that Britain secretly organized the recruitment and transfer to Australia of scores of leading Nazi scientists and weapons specialists after the close of WW2. Quoting newly declassified Australian Government papers, The Guardian says the German scientists sent to Australia under a top secret project codenamed Operation Matchbox included SS and Nazi party members. 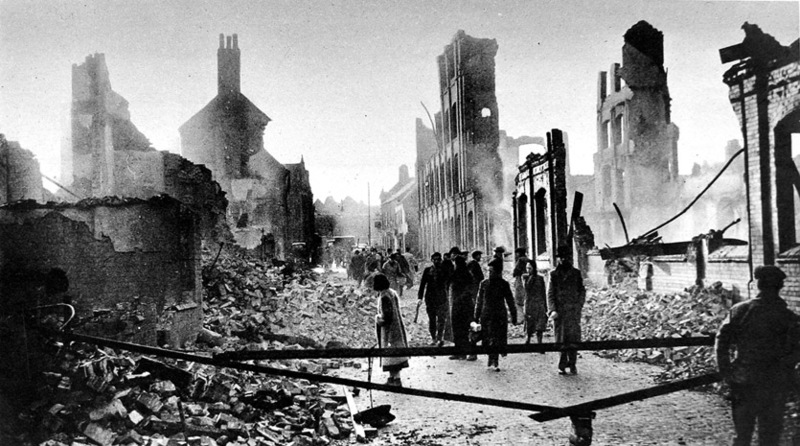 The same newspaper, on August 29, 2007, reports that, contrary to general assumption, German scientists and technicians were forcibly evacuated from Germany to Britain for more than two years after cessation of hostilities. In other words, they didn’t volunteer. From what we can deduce, the same applies to those who ended up working in the US and the Soviet Union. In the post-war years in the US, Project Paperclip remained hush-hush and only a select few knew of its existence. It wasn’t until much later the American public learned the truth – or part of the truth at least. A US Justice Department report dated December 2006 states: “In the 1970’s, the public was shocked to learn that some Nazi persecutors had emigrated to the United States. There were calls for their expulsion and legislation was passed to facilitate their deportation. OSI (the Office of Special Investigations) was created in 1979 to handle the caseload”. In the report, the Justice Department goes to great lengths to explain that the obstacles to success in prosecuting these Nazi war criminals were formidable. It lists numerous reasons supporting this opinion – not the least being that so much time had passed and many of the recruits had died. Several prominent US newspapers have claimed that the Justice Department report reveals OSI investigators learned some of the Nazis were knowingly granted entry to the US even though government officials were aware of their pasts. Some journalists have observed that America, with its proud history of providing sanctuary for the persecuted including Holocaust survivors, had ended up giving asylum to some of their persecutors. A New York Times article dated November 13, 2010 takes the Justice Department to task for sitting on its report for so long. The article states: “The 600-page report, which the Justice Department has tried to keep secret for four years, provides new evidence about more than two dozen of the most notorious Nazi cases of the last three decades”. However, it’s the article’s intro that caught our eye. It reads: “A secret history of the US Government’s Nazi-hunting operation concludes that American intelligence officials created a safe haven in the US for Nazis and their collaborators after WW2 and it details decades of clashes, often hidden, with other nations over war criminals here and abroad”. While over 300 Nazi migrants have either been deported or refused visas to America since OSI’s formation, the Justice Department’s report leaves no doubt the US Government collaborated with notorious war criminals and knowingly granted them entry into the US. The CIA doesn’t escape censure either. Its “use of Nazis for postwar intelligence purposes” comes under the spotlight in the report. So who were these Paperclip Nazis? There’s obviously too many Paperclip Nazis to name them all, but here’s a few confirmed names that kept popping up in our research. Rocket engineer and prominent Nazi Arthur Rudolph was a major player in the development of Germany’s V-2 rocket before being brought to the US. Rudolph subsequently worked for the US Army, developing missile systems, and for NASA, helping pioneer America’s space program. After being investigated for possible war crimes, he struck a deal with the US Government that enabled him to depart the country without being prosecuted (in the US).One of the accusations leveled at him was that he’d worked thousands of slave laborers to death – an accusation he denied. 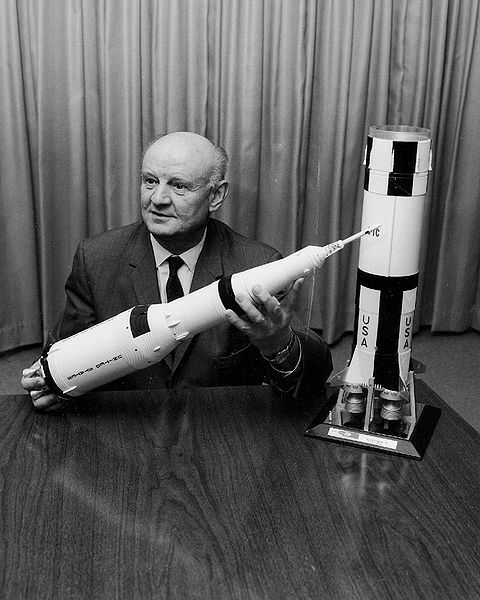 Paperclip Nazi Arthur Rudolph proudly displays a model of a NASA rocket. Engineer Georg Rickhey was awarded the War Merit Cross for his work overseeing Germany’s production of the V-1 and V-2 rockets. After being brought to the US, he was returned to Germany to face accusations of having cooperated with the Gestapo and the SS. However, lack of evidence saw him acquitted and returned to continue his work in the US. 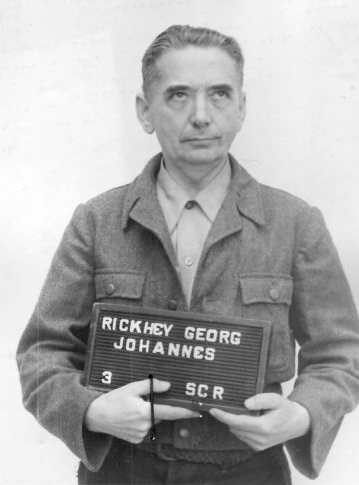 Nazi Georg Rickhey before being transferred to the US. 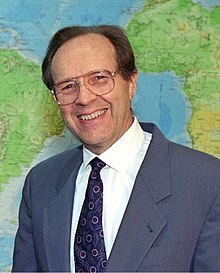 Physiologist Hubertus Strughold, Chief of Aeromedical Research with the German Luftwaffe, subsequently worked at a high level in medical positions in NASA and the US Air Force. Strughold was bestowed the unofficial title of ‘the father of space medicine’ for his studies of the effects of spaceflight on astronauts. Before and after his death, he became the subject of several investigations into alleged war crimes, suffering significant damage to his reputation.One allegation leveled against him was that he was involved in Dachau Concentration Camp experiments, including one in which camp inmates were exposed to freezing conditions. Since Strughold’s death, debate has raged between former colleagues and between fellow scientists. Some insist his involvement with the Nazis should preclude any honors being bestowed upon him while others claim there was no evidence to prove he was guilty of the crimes he was accused of. Perhaps the most prominent Nazi import was rocket scientist Wernher von Braun who is referred to as ‘the father of rocket science’. Herr von Braun spearheaded Nazi Germany’s development of rocket technology, and later, in company with key members of his team, became a leading figure in America’s rocket program. Along with his protégé Doctor Hermann Oberth, he was an integral part of America’s first Moon-landing. 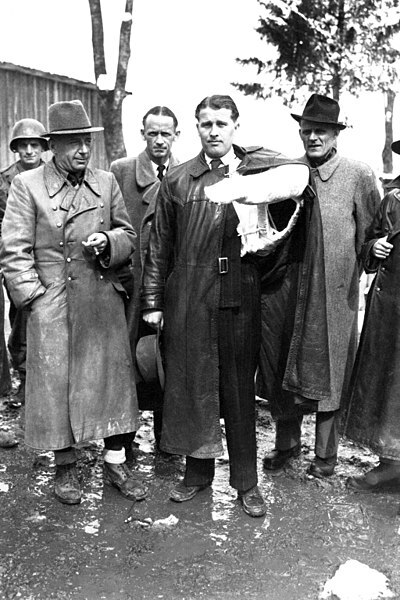 An injured Wernher von Braun surrenders to the Americans. (1945). In the biography of von Braun on NASA’s official website, readers are advised the scientist engineered the surrender of 500 of his top rocket scientists, along with plans and test vehicles, to the Americans. He worked with the US Army for 15 years developing ballistic missiles before being sent to the US and eventually becoming a naturalized American. 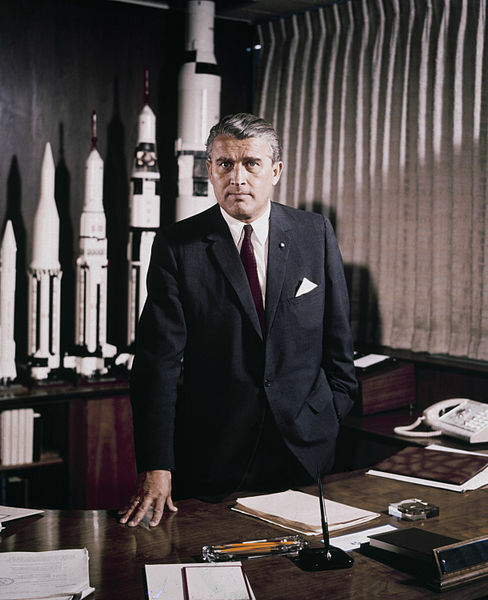 Von Braun…in the top office at NASA 21 years later. Given that mind control as we know it was first mastered during Hitler’s reign, it’s no surprise Nazi psychiatrists were also among those brought into the US post WW2. As Dr. Thomas Roeder and co-authors Volker Kubillus and Anthony Burwell revealed in their 1995 book Psychiatrists: The Men Behind Hitler, psychiatry was highly valued in the Third Reich. From declassified Paperclip files it’s obvious the science of the mind was equally valued by US authorities. What’s insane is that after the American public had paid an enormously high price to win WW2, US taxpayers then paid for Josef Mengele’s protégés to live and work in America. This means that Doctor Mengele’s dark scientific legacy not only included the countless victims of the Holocaust experiments he conducted, but also the thousands of American and Canadian casualties of the MK-Ultra program. Auschwitz concentration camp…just a stepping stone for Mengele and his associates. When considering Project Paperclip’s influence on modern mind control programs, the doctor’s moniker The Angel of Death suddenly becomes even more relevant. The Unit 731 Japanese Biological Warfare research facility. It seems there was another post-WW2 program remarkably similar to Project Paperclip, involving Japanese scientists and war criminals rather than the Nazis. The US was a key player in this program, too. As a comparative example, it’s worth studying to better understand why Western superpowers protected known war criminals throughout the mid-late 20th Century. This program involves a ghastly human experimentation project at the infamous Unit 731, an isolated Japanese Biological Warfare research facility located in what was then Manchuria, a Japanese puppet state, but is now Northeast China. The experimentation project was the brainchild of the notoriously cruel General Shirō Ishii, a scientist who was effectively Japan’s equivalent of Dr. Joseph Mengele. To refocus on Project Paperclip, there’s no doubt that bringing Nazi scientists into the US fast-tracked its scientific programs. However, it’s our opinion the project had political and moral ramifications for American society as well. As we wrote in chapter 2, mind control was a fascist technology that appears to have enabled assassinations of many important American figures. And in chapter 7, we mentioned how a Splinter Civilization appears to have suppressed advanced technologies and used them for their own ends – much as the Nazis hid secrets from the German people before and during WW2. Just as science and psychiatry were such a large part of the Third Reich, Project Paperclip had profound effects on American and Western society as a whole. In fact, it could easily be argued fascism subtly wormed its way into government ideologies the world over. Added to this concern is the fact that there are still a large number of classified Project Paperclip documents in existence. If their contents are more controversial than, or even as controversial as, those of the declassified documents, the mind boggles at what secrets they hide. What else were the Nazi recruits used for and how many more war criminals were admitted to the US at war’s end? Let’s not forget the UK and Australia either; they had their Project Paperclip equivalents as did Russia. At least one conspiracy theory author claims Josef Mengele briefly lived and worked in the US before being transferred to South America. Mengele’s name appears in no Paperclip documents, however. At least not in any declassified documents. Josef Mengele’s…his dark legacy lives on. If and when the remaining files are ever declassified, they may reveal even greater collusion between Nazi Party survivors and the US Government. In fact, we suspect they will. Otherwise, why do they remain classified? Perhaps it’s not too big a stretch to suggest that Nazi ideologies continue to the present day behind the veil of supposedly free societies and governments. Some conspiracy theorists go even further and suggest the Fourth Reich – a long-predicted successor of the Third Reich – has already been achieved. And in the United States, no less! Citing evidence of high-ranking survivors of Germany’s Third Reich being given sanctuary in the West through top-secret operations like Project Paperclip, this theory suggests Nazi practices like human experimentation, media manipulation, military aggression and 1984-style government controls on citizens have become a reality. We don’t claim to have all the answers on this subject – or any answers for that matter. But one thing’s for sure: Project Paperclip, not to mention Unit 731, deserves more attention from historians and mainstream media than it currently receives. It is perfectly possible for a man to be out of prison, and yet not free – to be under no physical constraint and yet to be a psychological captive, compelled to think, feel and act as the representatives of the national state, or of some private interest within the nation, wants him to think, feel and act. The nature of psychological compulsion is such that those who act under constraint remain under the impression that they are acting on their own initiative. The victim of mind-manipulation does not know that he is a victim. To him the walls of his prison are invisible, and he believes himself to be free. That he is not free is apparent only to other people. His servitude is strictly objective. MK-Ultra, the CIA’s far-reaching mind control program, was an umbrella project spawned from the US Government’s super-secret Project Paperclip, a sinister venture that involved bringing dozens of Nazi scientists to America immediately after World War Two. Some believe MK-Ultra’s beginnings actually go back to the horrendous psychiatric experiments the Nazis conducted during the Holocaust. Researching declassified CIA documents, we also became aware of the often-disastrous impact MK-Ultra had had on the lives of CIA operatives and unwitting US citizens over the years. Some of America’s highest profile assassins (including the likes of John Lennon’s killer Mark David Chapman and Robert Kennedy’s assassin Sirhan Sirhan) claimed they were CIA-programmed killers hypnotized by MK-Ultra…The media portrayed them as crazed lone gunmen, so naturally the public paid little attention to their claims. Sirhan and Chapman – Manchurian Candidates? We believe it’s possible some of these men were mind-controlled soldiers, or Manchurian Candidates, carrying out assassination orders their conscious minds were not even aware of. 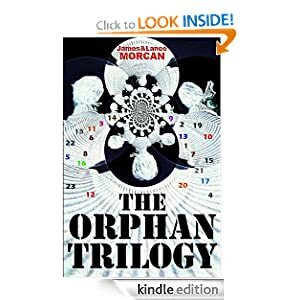 Our conspiracy thriller series The Orphan Trilogy (The Ninth Orphan / The Orphan Factory / The Orphan Uprising) features prominently on this list.